Here is my personal chakra balancing meditation which includes 7 affirmations to balance your chakras. Your chakras represent the seven energy centers in the subtle energy body. The subtle body is part of the human energy field – also called the aura. It is believed that these seven centers align with the endocrine system in the physical body. Each chakra has its own vibrational frequency and is representative of certain colors, musical notes, organs, functions of the body and personal and spiritual characteristics. 1. Sit comfortably with your eyes closed. Take a few deep breaths to relax. If at all possible sit cross legged on the ground. If you can’t be outside on the ground make sure you sit up straight with stocking feet flat on the floor. 2. Focus on the first chakra or “root” chakra located at the base of your spine. When your root chakra is balanced you are grounded and feel secure in life. In your mind’s eye see this chakra as small red disque. Now mentally turn on the energy you are sending to this region and see the circle begin spinning clockwise and growing larger and become brighter. I like to see it as if it were a large fiery red ball. “Feel” the energy spinning the chakra in this area of your body. Affirmation: All is well. I am safe and secure and all my needs are met. 3. Moved the energy up to the second chakra which is located in the area of the reproductive organs. When your second chakra is balanced you are able to express your sexuality and innate creativity. See this chakra as a small orange disque. Now send the energy to this region and see it growing larger and brighter and spinning in a clockwise direction. In my mind I usually visualize it as a beautiful rising sun. “Feel” the energy spinning in this center in your body. Affirmation: I am creative in all my endeavors and passionate about life and love. 4. Move your attention up to your solar plexus area. See the third chakra as a small yellow ball. When this chakra is balanced you are ethical and comfortable with your personal power. Send the energy to the third chakra and see it expanding into a huge spinning golden sun. Affirmation: I honor my values, uphold my ethical standards and assert my personal power wisely. 5. Focus your attention on the area of the heart. See this chakra as a green ball. When this chakra is balanced you are patient, loving and compassionate. Send energy to your heart chakra and see it growing, spinning and glowing like a huge emerald. Feel it pulsating in your chest. Affirmation: I am loving, kind and compassionate with myself and to others. 6. Move your attention to the throat area. In your mind’s eye see a blue circle of energy spinning just above the collar bone. When this chakra is balanced you are able to speak up for yourself and you communicate clearly and honestly. Send a burst of energy to this chakra and see the blue ball flower into a beautiful blue hydrangea blossom. Affirmation: I am a good communicator. I think before I speak and listen respectfully to others. 7. Move your attention up the sixth chakra located in the center of the forehead just above the brow line. The sixth chakra is also called the “third eye.” See it as a spinning as a violet colored wheel. When this chakra is balanced you more spiritual, less controlled by the ego and attuned to your intuition. Send energy to this chakra and see it growing into a large pulsating indigo swirl. I find it helps to visualize it as the swirling center of our universe. Feel the energy of this chakra spinning in the middle of your forehead. Affirmation: I clearly hear my intuition and trust and follow it. 8. Move your attention to the top of your head. See a golden white circle of energy swirling around this area. When this chakra is balanced you feel at one with the All, the personality recedes and an awareness of being nothing but pure consciousness comes forward. Send energy to this spinning golden circle and see it growing into a glowing orb that illuminates your face and head and sends sparkles of warming energy from your head to your toes. Affirmation: I pure light and energy and one with all life. Once you reach the seventh chakra take the sparkles that reached your toes and send this energy to the first chakra and go through all the chakras two more times. I recommend doing this visualization three times. It should take you no more than five minutes to do all three passes of the chakras. Try it. You’ll find that the more you use this meditation the more qualities related to each chakra you develop to their full potential. I hope you enjoyed this article. If so please share it with a friend on Twitter, FB or G+. Thank you. P.S. 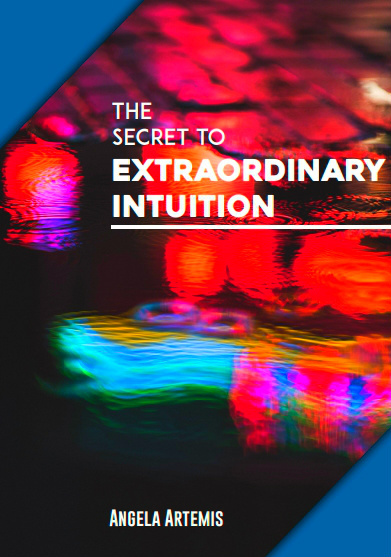 Learn more about how to hear your intuition – here. 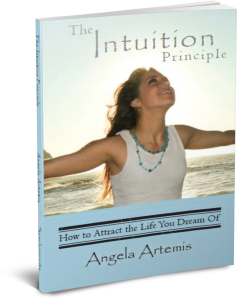 Is Your Intuition Nudging You to Pursue Happiness vs. Money? The Afterlife: Where Do We Go When We Die? I have learned so much more about the chakras since I have been practicing yoga. I’ve also learned about the Koshas or life sheaths and prana. And thank you for the meditations. You are so welcome! Glad I reminded you of the bracelets too. 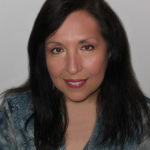 Hi Angela, I have been doing chakra balancing work myself using reiki energy. It will be nice to incorporate your steps as well. Thanks for the detailed explanations! Reiki is awesome. I’m sure your chakras are already quite balanced Evelyn! I’m glad you found my explanations helpful. I can’t wait to try this today! I’m a huge fan of positive I AM affirmations. And after a long work week I’m craving balance. I’ve always been interested in chakras but never knew much about them. I’m looking forward to learning more!! Great. 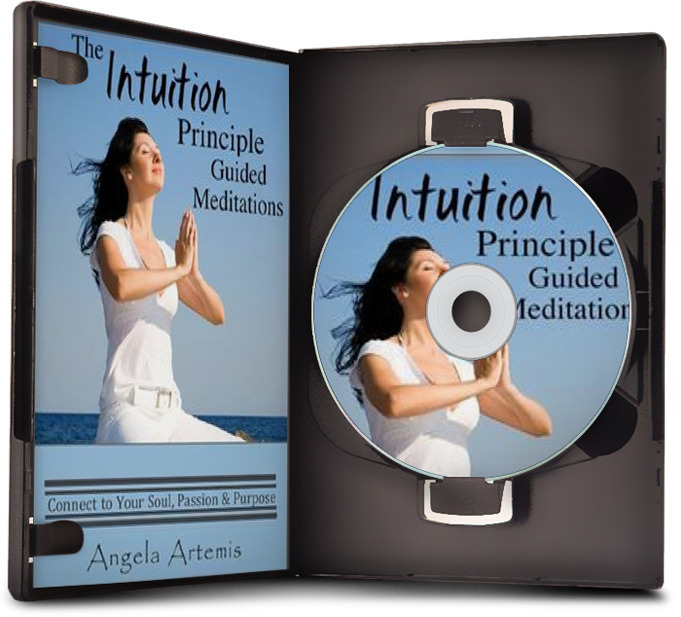 I can’t wait to hear back from you as to how the meditation works. What I have found is that we develop more of the positive qualities of each chakra the longer we focus upon them. This was wonderful! I’m printing it out now and I’m going to use it for my morning meditation. Thank you for this gift! I loved this post and I am going to print this post and practice the meditation. Among Hindus, we have the sacred thread ceremony that involves certain rituals thrice a day that involves chanting mantras (including the Gayatri mantra) and actions for breath control. Each move has a connotation. The mantra itself must be recited in a specific intonation. Those who practice it diligently and keep a control on their diet, hardly ever fall sick. It is amazing. I’m so glad you loved this post. I’m sure you have so many ceremonies and rituals pertaining to chakras and spiritual growth that we don’t. The Indian culture is so much or (or at least it had been) focused on spirituality than the Western cultures. Yes, please let me know how you fare with this meditation. What a thorough explanation of the Chakras and how you can visualize them when you are meditating. I love the idea of repeating the process three times so that you can really internalize the affirmations. Great information! Thanks for sharing! Take care. I’m so glad you enjoyed this post and found it useful. Repeating it three times really does cement in the affirmations and the development of each chakra. I don’t understand about “clockwise.” Is that clockwise as seen or felt from within my body, e.g. moving as if from my right hip to pubis to left hip? Or clockwise as seen in a visualization of a diagram, where the figure’s right would appear as 3 o’clock?